You know those furniture makeover stories that start with an amazing find on craigslist … or the thrift store … or a garage sale … or some freebie snagged from the side of the road? The ones that talk about the ‘great bones’ or an ‘interesting curvature of a leg’ but it ‘just needs some TLC’? Hard to believe I hauled this thing all the way to Chicago from New Jersey. Must be some silly sentimental attachment because it was one of the very first-ever furniture purchases I made for my very first-ever grown-up apartment. The pillows are simple envelope pillows that I stitched up. The red and gray pillows were given a few felt-covered buttons for added interest. It offers a functional place to sit and put on shoes … and provides a place to store backpacks out of sight. The best part: It gives this first impression of our home a great punch of color. P.S. 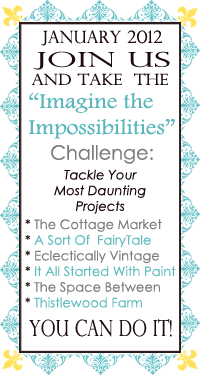 If you’re visiting from one of the link parties, then I hope you’ll click here and join me and five incredibly talented bloggers in our collective “Imagine the Impossibilities” challenge. It all culminates in a January 31 multi-blog link party … so you better get started. No pressure. Rooster — I haven’t tried the oil-based. I will probably try it though when I find myself rethinking the dark cabinets in the kitchen. Uh oh … I hope my hubby isn’t reading this! VERY impressive! I can’t believe it’s particle board. Love your color combo! absolutely wonderful and FUN!! Totally love your blog name – “it all started with paint”! that is so fun! i love the pop of color it adds to your space! I am in love! It is so color-licious! I would have never guessed that it was one of those particle board pieces of furniture. The fabric is great!!! Please visit and link up to Find YOur Craft Friday… you would be a great addition!! That is so cute and I love the whole area. what a PERFECT up-cycle! I adore your new bench look! :o) it is official I am going to be on a search for a bench just like this!